With the OMEGA 8 you’ll ﬁnd yourself at the top of the XC league! The OMEGA 8 is the highest performance glider in the serial class. It has yet again set a new benchmark, just like the OMEGA series gliders before it. The new ADVANCE ﬂagship glider embodies tradition and progress at the same time. Its handling and design are unmistakable. 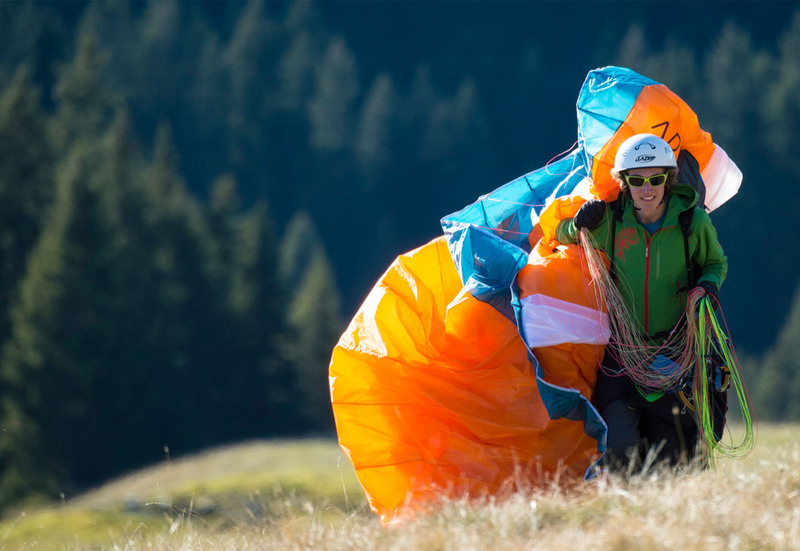 The OMEGA 8 is a purebred high-performance paraglider that should only be flown by highly experienced, performance-oriented long-distance or competition pilots. In order to be able to fully master an OMEGA 8, a pilot should already possess experience with high-performance gliders in different meteorological conditions. A regular flyer with these skills will be able to safely exploit the paraglider’s huge performance potential and cover long distances in a controlled and relaxed manner. With distinctive, direct handling and incredible performance the OMEGA 8 has plenty of allure. Two of its outstanding characteristics are its smooth and efﬁcient speed system and the incredibly good stability at speed. The twist on the airfoil’s angle of attack is optimized for stability. Sensitive feedback from the wing tips gives the pilot complete control even in the roughest air. With a glide ratio of 10.6 and a useable top speed of 59 km/h, the OMEGA 8 is by far the best performer in its class. And the OMEGA 8 comes into its own in accelerated ﬂight through turbulent air. The solid stability, balanced pitch and a speed system that is ﬁne-tuned to the wing’s proﬁle give the competitive pilot the edge. The OMEGA 8 builds on the proven three liner concept of the 2009 ADVANCE World Championship winning glider and the X-Alps winning prototype. The OMEGA 8 is also one of the lightest performance wings with a new construction, carefully selected materials and nylon wire bat-tens at the leading edge. All these new technologies have been rigorously tested and reﬁned to perfection. The high aspect ratio, carefully calculated profile, and competition lines make the OMEGA 8 a high-performance glider, even in turbulent air. The performance is clearly expressed with a glide ratio of 10:1 and an exceptional glide angle in the upper-speed range. The Speed Performance Indicator (SPI) also helps experienced pilots to choose the optimum speed and enables them to greatly improve average speed on long-distance flights. The OMEGA 8 is equipped with a variable transfer speed system that enables shortening or lengthening of the speed bar extension range and pressure to suit the user’s anatomical position: smooth, triple transfer as long as the legs remain bent, and efficient, double transfer with outstretched legs. With a more compact weave and an additional coating of the separate twines, it has proved possible to increase the UV-resistance as well as the abrasion resistance on the Liros competition lines significantly. The loops at the line junctions are reinforced, which results in lower contact surface pressure. ADVANCE pay great attention to small details. Sewn-in compression and Mylar straps increase the canopy stability, partially closed cells increase the internal pressure and the winglets decrease the induced drag (vortex effect). Velcro closures on the wingtips make it easier to remove sand, snow, and debris from the glider. Like all ADVANCE models, the OMEGA 8 incorporates a swivel on the steering lines and different brake handles with magnetic clips, depending on the canopy size. The many small but important details like these add the finishing touch to the product.